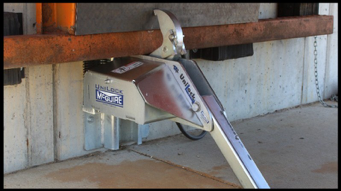 Vehicle restraint: McGuire, a dock solutions distributor, has introduced the UniLock vehicle restraint, a trailer-positioned restraint that does not require a trailer to be reversed to release "RIG wedge" pressure. (RIG, or "rear impact guard," wedge is caused when the trailer is pushed forward during loading/unloading and the trailer's RIG applies so much pressure to the restraint's hook that the truck driver must reverse the trailer in order to release the restraint.) The UniLock has an advanced cam design that first rotates the hook away from the RIG to remove the pressure, and then rotates down to a stored position. 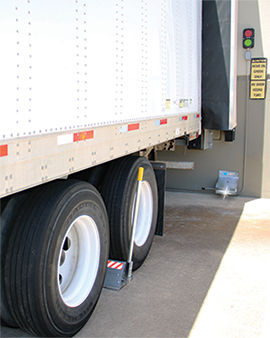 Trailer restraint: Entrematic, a supplier of loading dock products, has introduced the Serco Versachock wheel chock wireless trailer-restraint system (Model SMC). Serco Versachock was engineered to provide a cost-effective means of securing trailers while communicating operation status with drivers and dockworkers to ensure a safe and productive dock operation. The Serco Versachock is a portable vehicle-restraint system that accommodates a wide variety of trailers and vehicles regardless of the condition or presence of an ICC bar. Versachock includes a wireless engagement design that provides wheel detection at all engagement ranges and requires no chock cabling or permanent structure installed on the drive to secure the vehicle, the company says. Dock safety gate: Mezzanine Safeti-Gates Inc., a manufacturer of industrial safety products for warehouses, DCs, and manufacturing facilities, has introduced a new "Dock-Lift" safety gate that provides a safe environment for employees moving material to and from loading docks. For more than 30 years, the company has provided dual-gate safety systems used primarily in elevated pallet drop and picking operations. 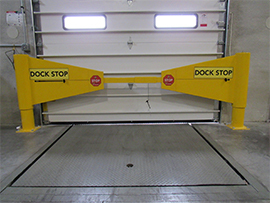 With the new Dock-Lift gate, the company has extended its product line into loading dock operations. Originally a custom design for a national grocery chain to make its operations safer, the Dock-Lift safety gate is a self-closing gate designed to automatically close and lock into place as the lift elevates, forming a barrier for employees on the lift that are making the transition from the tractor-trailer to the loading dock or ground level. The gates stay locked until the lift is lowered and back on the ground. The gates automatically open when the platform reaches ground level. Loading dock safety chain: Wisconsin-based aftermarket accessories company APS Resource has expanded its product line with the addition of the "Dual Chain," a set of security chains that protect workers from edge-of-dock accidents. The chains offer facilities a low-cost safety option that's designed to comply with the necessary OSHA standards, the manufacturer says. 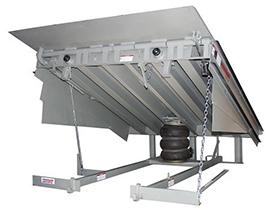 Dock leveler: Poweramp's CentraAir (CA) air-powered dock leveler incorporates the use of existing plant air or air from a dedicated compressor along with an industrial automotive-grade air bellows system to raise and lower the platform. It's operated with pushbutton activation and requires no electricity in the pit, making the unit suitable for washdown applications or wet environments, the manufacturer says. 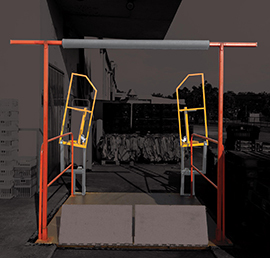 Dock gate: The Dock Stop Gate from "Save"ty Yellow Products is a safety solution designed to prevent accidents—specifically, accidents that result from fork trucks driving or backing off docks at warehouse and facility gates. The Dock Stop includes two rotating arms and two 42-inch-tall mounting bollards (30-inch bollards are also available) connected by a sliding locking bar that locks in place with a pin. Dock scheduling software: Transporeon, a provider of cloud logistics software, has introduced a dock scheduling solution for retailers and manufacturing shippers. Transporeon's Dock Scheduler is meant to help shippers ensure shipments leave and/or turn up at the right time, avoiding detention charges and other fees/issues. The company says the solution reduces idling and waiting times by up to 40 percent, cuts average loading/unloading time by up to 60 minutes, and increases productivity by more than 20 percent. Feedback: What did you think of this article? We'd like to hear from you. DC VELOCITY is committed to accuracy and clarity in the delivery of important and useful logistics and supply chain news and information. If you find anything in DC VELOCITY you feel is inaccurate or warrants further explanation, please ?Subject=Feedback - : Spotlight on ... dock equipment">contact Chief Editor David Maloney. All comments are eligible for publication in the letters section of DC VELOCITY magazine. Please include you name and the name of the company or organization your work for.